All plants require a ready supply of macro and micronutrients within their growth medium in order to accomplish their standard physiological functions. The presence of appropriate concentrations of nitrogen (N), phosphorus (P), potassium (K), calcium (Ca), sulfur (S), magnesium (Mg) and iron (Fe) have all been recognised as essential for optimum plant growth. Deficiencies in any of these nutrients can manifest (in addition to other characteristics depending on the nutrient in question) as a reduction in leaf chlorophyll content. A depletion in overall leaf chlorophyll content reduces the amount of solar radiation that can be absorbed which in turn limits the efficiency of corresponding photosynthetic processes thus lowering primary photosynthetic production. 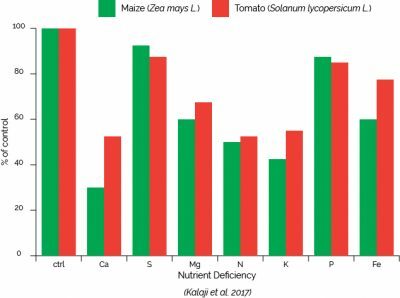 The figure below shows percentage chlorophyll depletion in Maize and tomato plants in response to specific nutrient deficiency calculated from chlorophyll extraction and spectrophotometer assays (Kalaji et al. 2017). The measurement of chlorophyll content can therefore yield important information relating to the presence of biotic stress factors and also of abiotic issues such as light, drought and pigment inhibiting herbicide damage (all of which are also significant in leaf chlorophyll content). Chlorophyll content was traditionally measured in the laboratory by extracting the chlorophyll itself from a leaf sample using acetone before calculating the chlorophyll concentration by spectrophotometrically measuring absorption at 663 nm and 645 nm. This process is time consuming, destructive to the plant material and above all, impractical in applied situations. The other option is to use a hand-held device such as the CL-01 Chlorophyll Content Meter which calculates relative chlorophyll content using dual wavelength absorbance measurements through a leaf at 620 nm and 940 nm. 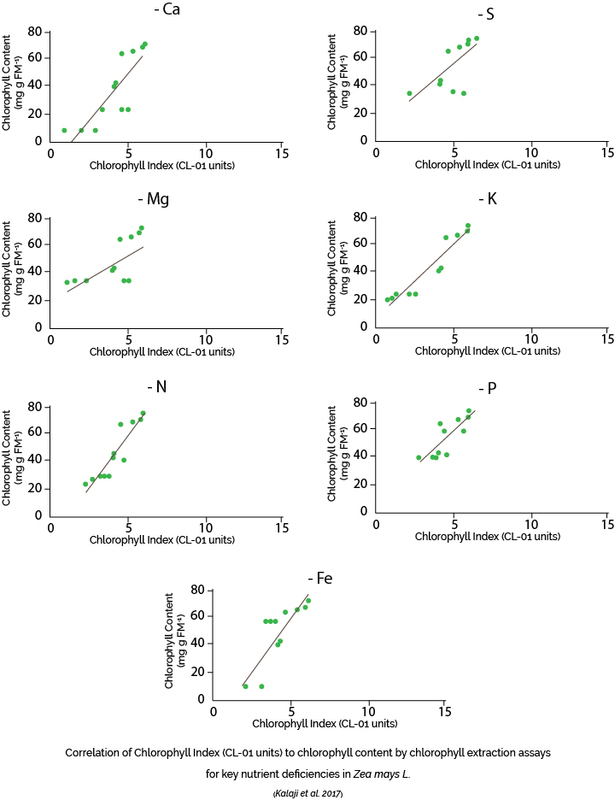 Measurements from the CL-01 correlate highly to chlorophyll extraction assays in determining chlorophyll depletion for N, P, K, Ca, S, Mg and Fe deficiencies (Kalaji et al. 2017) as shown in the figure below. Based on the findings of Kalaji et al. (2017) and Cassol et al. (2008), the relative chlorophyll units of the CL-01 chlorophyll Content Meter linearly and positively correlate to actual leaf chlorophyll content in mg/g/FM-1 in many species.